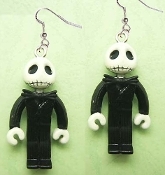 Funky LEGO inspired style JACK SKELLINGTON DANGLE EARRINGS - Nightmare Before Christmas Character Theme - Gothic Halloween Zombie Novelty Costume Jewelry. Punk Cosplay Skeleton Skull Pirate Headhunter Witch Doctor Charm Miniature Accessory. Rubbery Plastic Dimensional Toy Mini Figures, approx. 1.25-inch (3.13cm) Tall.